The cocoa tree is native to the lowland rainforest regions of central and northern South America, particularly those surrounding the Orinoco and Amazon rivers, although the cocoa tree is now pan-tropic. The fat extracted from the seeds becomes cocoa butter and has a variety of cosmetic and dietary uses. Cocoa butter (or cacao butter) is a pale white to yellow solid edible fat with a wonderful, slightly sweet chocolate taste and aroma. It has a melting point of between 32-35 deg c. The cocoa butter present in quality chocolate provides that fabulous texture that just 'melts in the mouth'. While having obvious dietary uses (chocolate - look, there's another couple of pounds I just gained -Eek!) 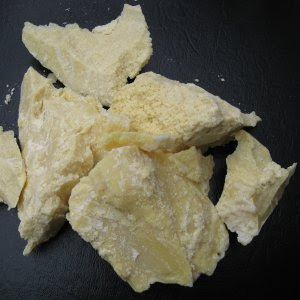 it is also a very rich compound, with excellent emollient properties thus having numerous uses in hair and skin care. Cocoa butter is one of the most stable and concentrated natural fats and does not go rancid easily. Most skins tolerate it very well however, where there is evidence of irritation or sensitivity, discontinue use. Has been used for centuries to help keep the skin soft and supple and has been called 'the ultimate moisturiser'. Excellent for use on very dry, dehydrated and chapped skin as it moisturises, soothes and protects. It is a natural source of vitamin E which has numerous skin benefits. Contains tocopherols and polyphenols that have antioxidant properties to suppress free radicals soothe irritations. Cocoa butter is often added to suntan product as it can help to enhance the appearance of a suntan (although be aware that cocoa butter itself does not contain a SPF). Often recommended for skin conditions such as eczema, psoriasis and dermatitis, not only for its moisturising properties but it also contains CMP (cocoa mass polyphenol) that inhibits the production of immuno globulin IgE, (which may exacerbate the symptoms of asthma and dermatitis). Helps to protect sensitive skin from external elements by providing a moisture-retaining barrier to the environment. Cocoa butter has a long tradition of being used by pregnant women to help prevent stretch marks as well as reduce their appearance. Recent researched has indicated the possible health benefits gained from eating chocolate but there has also been indications that massaging with cocoa butter may help to relieve stress and boost the immune system and could help to prevent cancer.